Baltic RED is one of the largest commercial real estate development and management companies in the Baltic States. We have been providing high quality integrated commercial real estate services since 2002. Our specialty is the retail real estate market, but we also develop and manage logistic centers and office buildings. The company employs more than 40 employees. Our team, which consists of professionals from real estate, retail and other areas, expertly brings a project from concept to successful implementation. We are responsible for more than 600 thousand square meters of local as well foreign investors’ properties. Of these properties, 250 thousand square meters are comprised of projects developed by our own real estate development team. Our operations are successful in Baltic States and Belarus markets – these are the regions that we evaluate constantly and have expert knowledge of the local environment. We are members of International Council of Shopping Centers. Here we contribute to the Baltic States committee by contributing our insights and consultations. The success of Baltic RED team members was awarded with the prestigious “Euromoney Awards 2008″ prize. 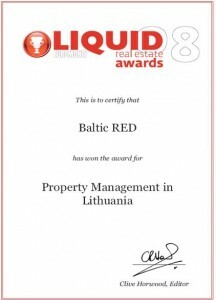 Baltic RED was recognized as the best Real Estate Management Company in Lithuania and as one of the top ten best Real Estate Management companies in the Northern European region. Our goal is a consistent and long-term asset growth. We not only develop and manage the property; we take on responsibility for your investment value.